Useful product reviews on do-it-yourself home security products; wireless alarms, barking dog alarms and more. Inova is the new leader in flashlights. Well, I Remember when Mag lite flashlights hit the scene back in 1979. They were considered the most rugged, well-built, brightest flashlight you could buy for your money. Now, they are to old for Product Review Ratings to even review them, anymore. I held off buying one many years because I thought they were too expensive. It wasn’t until I became a home owner that I realized how important it was to have at least one good quality flashlight around the house. I bought the large black Maglite that uses Double-D Batteries. Unfortunately, the Maglite never lived up to my expectations. It looks and feels like a heavy duty flashlight, but doesn’t seem very effective at the one thing I bought it for: Bright light. I also own one of the smaller Maglites and was never all that impressed with it either. I’ve had other, cheaper flashlights that produce brighter light and when I need a lot of light fast, I use a big, candle powered lantern flashlight. I bought a two-pack of small, LED flashlights at my local Harbor Freight store. Good lights, yes, but probably not the best. They were great at first, but stopped working after a few months. So, what do you do about a better flashlight? You go look for the best, and I think I’ve found it. There is nothing more aggravating than not being able to find a good flashlight at home when you need one. The shelf life of your typical AA, AAA, C and D batteries is not very good. The best LED is not only brighter, but will give you considerably longer battery life. Consequently, unless you are replacing the batteries every 2 months, chances are good that flash light kept on your shelf will probably not be very bright by the time you get around to needing to use it. How stressful is it to not have plenty of the right kind of batteries on hand when you need them? When it comes to LED flashlight technology, reliability is at least as important as brightness and lumens. The highest quality LED flashlights produce a far sharper, brighter more focused beam of light. Even the old standby Maglite has gone to LED flashlights. The better ones uses 123A Lithium Batteries which have a 10-Year shelf life. If you buy the best, you won’t have to wonder how strong the light is the next time you use it. The great thing about the Lithium Batteries is that once they’re done, they are really done. They don’t gradually get dimmer like traditional batteries, leaving you wonder how much light you will have left. Generally, the lithium batteries give you 2-4 hours of consistently bright lighting power. Lithium 123a Batteries are expensive if you buy them from the store. Get Lithium Batteries Cheap – Way cheaper than what you’d pay at Walgreens, Target, Walmart, etc.. below. I wouldn’t mind paying a tad more for the best led flashlight, anyway. The brand Inova and Maglite make a similar LED Flashlight. Both are well constructed with impact resistance materials and both claim to be the best led flashlight. After some research, I’ve chosen the Inova X03 Flashlight as the one that trumps all others. The Inova X03 is made from an aerospace aluminum material which is both impact and water resistant. The LED light is electronically controlled for precise directional light and has a 50,000 hour life. On the Inova X03 is a 3-Position switch where the end-cap is located. You can keep it locked to off, turned on momentarily, or turned on all the time. 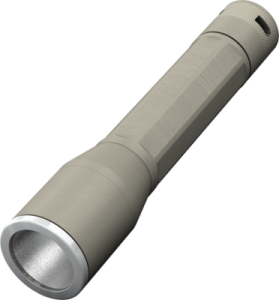 This is a well constructed flashlight; weighing only 5.57 ounces. Inova advertised that the X03 has an effective range of 457 feet and 4 hours of battery run time. Real world users have reported impressive results of up to 200 feet or so and say the run time is closer to 2 hours. I’ve searched Amazon and other websites for real user reviews on the X03 and have not found a user rating below 4 stars. Over 50 users, give the Inova X03 a rating of 4.5 stars. I am going to have at least one of the Inova X03 kept on the shelf in my den next to a box of the cheap Lithium 123a Batteries. lamp on and off from 5:00 to 10:00 PM During the winter hours. mechanical light timers have always been a pain for me to use. You have to line up those little stops in the time slot holes for the on and off positions. For me, this procedure has always been a confusing and tedious task. The numbers on the timer are difficult to see and you’re never sure exactly how close it is to the actual time. Surprisingly, three other programmable timers that came with my house are also mechanic timers: Timers for Lights, Sprinkler System Timer and Water Heater Timer. Actually, the water heater is for my pool but it is made to be used on Water Heater appliances as well. After getting my outdoor lights setup with the mechanical timer, I began considering how programmable timers for lights make a great security device. Why not buy a handful of them for turning on and off lights in the house? Or, even for turning a radio on and off when you’re not home during the day or evening, electric timers are great, little security devices, whether used for indoor lighting, lamps, aquarium, poop pump, outdoor lighting or music, TV and other natural sound in the home? Now, if only I could find a decent digital plug-in timer for lights switch that is quick, easy and less confusing to program. Here’s what I found for an easier, better Timers For Lights Solution and keeping track of our amps and watts. Timers for Lights make Home Security Devices. While Solar Security Lights outdoors are also great deterrent’s, Timers For Lights Indoors can make your home always look occupied. When shopping for programmable electric timers, it is important to understand that a Electric Timer can be either Digital Timer or a Mechanical Timer. When shopping for a Digital Timer my first time at the local Home Depot store, I asked for an electric timer and he gave me one of those mechanical timers which looked exactly like the old relic I already was using for the Christmas Lights. I asked him, “Is this the Best you can Do?”.. He quickly pointed to another display of fully programmable digital timers for lights ~ only about $13.95. I actually found these digital timers on sale online for $12.00 and bought four of them: One for the den lamp in back of house; one for the living room lamp in front of house; one for the bedroom upstairs and one for the boombox stereo to keep the cats occupied with music during the day. The Westinghouse Digital Timer is actually quite versatile. You can set the time and day, then program it for any day of the week, in multiple increments of time. Say, I want the radio to turn on and off every two hours, Monday through Friday at 10:00AM, 1:00PM and 3:00PM, this Digital Timer will do that and it is very easy to program: Just set your appropriate day and time, press program, choose your days, on/off times for each of the days and your set! It’s that simple. There is a button to override the program mode, so you can leave the programmable timer permanently plugged in and either turned on or off. If you want to use it, simply set it for AUTO. The Westinghouse makes a great light radio timer and it is certainly easier to use than the mechanical timers. I have only one complaint. Well, two really: For one thing, it is rather cheaply made. One of the five that I now own, has already broken. Two, the digital display is difficult to read unless it’s plugged into the wall outlet. When the unit is not receiving power from the wall outlet, there are two, little camera-type batteries backing it up which do not yield a very bright contrast on the digital display. It’s difficult to crouch down on the floor by a low, wall outlet and program the thing with your head turned sideways. It would be nice if these digital timers had a more powerful battery for programming the device while it is in your hand where you can read it. The little batteries seem to burn out relatively quickly, too, which I guess is a third drawback. I like the concept enough that I’m willing to pay a little more for an upgraded programmable digital timer. The other day I was online trouble-shooting Water Heater problems and came across an impressive array of Water Heater Timers. (See Below if you need a water or pool heater timer) I clicked the home page link and learned about the Intermatic Digital Timer. Actually, Intermatic makes a whole slew of timers: Outdoor Timers, Appliance and Lamp Timers, Water Heater Timers, Air Conditioning Timers, In-Wall Timers for your light switches. I thought, “surely they must also make something as simple as a Digital Plug-in Timer to replace the somewhat limited Westinghouse product, I’ve been using.” Lo and behold, they do! 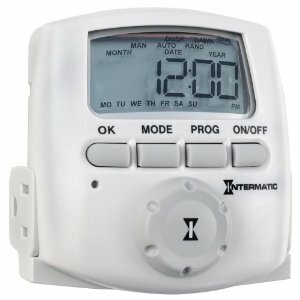 The Intermatic DT620CL 15 Amp Indoor Astronomic Digital Timer is an extremely Versatile Digital Plug-in Timer with capabilities and features that far exceed what I ever imagined possible. The DT620CL has built in astronomy technology to synch with the sunup and sundown times for your particular location. This means, you never have to program a timer switch or any other darn thing to allow it to function with your outdoor lights. Additionally, this Intermatic Light Timer is equipped with 28 Programmable events as a regular timer, or you can randomly time these settings in up to 30-minute intervals to mimic the way you might really operate the lighting in your house when you are not home. There is one mechanical feature on this digital timer which I absolutely love. It has a round turning knob sort of like on a home stereo receiver or radio for moving forward and backwards through the time and every adjustable setting. This makes it a breeze to program. The Intermatic Timer uses much stronger batteries than the Westinghouse, making the display much easier to read while you program it. The batteries should last you about three months and will also serve as a power backup if and when your electricity fails. Expect to pay as much as double for the DT620CL over the Westinghouse, but it is well worth it according to the many satisfied, Intermatic Timer users. The DT620CL Timer averaged 4 stars out of 5 among nearly 100 users and the price is right! Before I bought my last house I had never even heard of Old Republic Home Warranty. We bought and moved into a bigger, 17-year old home about 3 years ago. With the home came a few rather pricey, high-tech appliances. At the time we bought this home we were really excited about the fancy Bosch Dishwasher, Jenn-Air Range and extremely unique and expensive Kitchen Aid Refrigerator included in the sale. We thought these nice appliances really added to the value of our purchase. Boy, were we wrong. The home also came with a swimming pool which I was somewhat leery about, but had no genuine idea of what I was really getting into. To make a long story short, in a little less than 3 years, we have spent over $3,500 in maintenance and repair for the home’s appliances – and that doesn’t even include the swimming pool! High tech appliances with digital circuitry break and when they do they are not easy or cheap to fix. I recently had to replace the garage door springs on one of the two doors of my three-car garage; and while I was at it, I had the opener replaced on the larger, out-dated, adjacent larger larger door. In the last three years, the swimming pool required three major repairs: A $700 heat exchanger replacement and a $450 pump replacement. Then, there was the usual things: Hot Water heater required major repairs for a faulty installation and the Air Conditioner required a service call. We also had a pipe burst in our den, which required another $135.00. Our total maintenance and repairs add up to a little less than $5,000 in just three years. So, would a Home Warranty have paid for itself in our case? The answer is a most positive, absolute, ‘YES’. After discovering the Old Republic Home Warranty and First American Home Warranty, I decided to see what else is available and how they compare. Old Republic Home Warranty claims to solve all these problems, but there are over a dozen Home Warranty Protection Plans and they are priced very close to each other. Which one? Your basic Home Warranty ranges from about $275.00 to $350.00 a year. In addition to the yearly or monthly premiums, they charge you a $75.00 deposit and $50-$55 deductible for each service call. The basic fee in most cases doesn’t cover your Air Conditioner, Garage Door openers, washer, dryer, gas fireplace and numerous other, less common appliances you may have inside or outside your home. Those can be added at additional costs. Blue Ribbon Warranty, whom covers only the state of Colorado, charges $150 a year for swimming pools. I can expect to pay about $400-$600 a year to get my home warranted the way I want. (With the Swimming Pool, probably closer to $600) Even with the $75.00 deposit and $55.00 service call deductibles, I would have saved over $2,000. Like any Insurance Policy, what good is a Home Warranty if you don’t have 100% confidence that they can deliver the service that you need when you need it? The convenience of having a one-stop shop to call can also be your biggest risk factor. If I have a repair incident and cannot get a quick response from the warranty company, I have no place else to call or go. If I am paying for a service that is not giving me as good or better results than I would get without a warranty company at all then my money is being wasted. I also need to have the confidence and assurance that they are going to fix and pay for my problem. There is really no other way to measure the reliability of a Home Warranty company than to talk to others who have used them. Having done some research and talking to other home owners, there is only one company that would give me this level of confidence. Fortunately, there is a website completely dedicated to reviews and user opinions on Home Warranties: Home Warranty Reviews. Some quick research on reviews and user opinions convinced me that neither Old Republic nor First American Home Warranty would make me confident that my premiums were well spent. Too many buyers complained that the service was either not rendered in a satisfactory amount of time or that they refused to cover a defective appliance or service issue. Out of 170 User Reviews, Old Republic Warranty received an average user rating of just under 3 stars. First American Home Warranty had 152 user reviews and received an average rating of just 2 stars. I realize that user reviews can be negatively biased because people are much more likely to comment when something goes wrong than when something goes right. On the other hand, the high number of negative reviews and comments were simply too much for me to ignore. An insurance plan has to provide 10)% assurance to me that my money in the form of regular premiums is not going to waste. Before you go with the most popular Home Warranty Protection, make sure you know what people are saying in your neighborhood about Old Republic Home Warranty. How do you rate Old Republic Home Warranty? Should We Keep Our Burglars in the Dark? According to FBI research, outdoor lighting is an effective theft deterrent. According to your home security salesman, outdoor lighting is an effective way to help burglars see what they’re doing as they break into your home. I am not joking. Several months ago this is what a home security installation company told me. Obviously, the goal of professional home security companies is to make prospective customers feel unsafe and vulnerable to those bold burglars who appreciate the generous amounts of lights around your home. So, who do we believe? This guy is full of the stuff a burglar would step in if there were horses in my backyard. If I were a burglar who feared the dark, I’d probably have a flashlight with me. If I needed generous amounts of light to break into a door or window, why would I be doing it at night in the first place? If for some strange reason you still believe a burglar prefers a blazing, bright spotlight glaring upon his back as he attempts to break-in through your windows at night, you might consider what a security light means to other types of intruders. A Motion Light is a Security Light – a spotlight that goes on when motion is detected. Security lights can be programmed for motion sensitivity, light sensitivity and for how long the light stays on. A Solar Security Light behaves exactly the same way as an Electrical Security Light. There are some good reasons to go with a Solar Powered Security Light, but there are also a few reasons to choose electric or battery-powered lighting. Convenience. No electrical wiring required. Easy to install. Saves Energy. Since they are powered by the sun, saves on the environment and your utilities bill. Looks and Appearance: No cords means clean looks and installation. Versatility. Can be placed anywhere the sun shines. Requires solar energy and needs to be installed where it is exposed to generous amounts of sun. Solar panels lose energy over time and are more susceptible to the weather elements and wear and tear. A solar powered security light doesn’t have to be the one and only outdoor lighting solution for your home, but they certainly are welcome in areas that lack convenient power outlets and other locations where you cannot bury or hide cabling. What prompted me to write this article was the success and good luck I’ve had with landscape lighting and solar motion lighting in both the front and back yard of my home. Solar Lighting has made it possible for me to make household improvements I would otherwise not attempt without an electrician or at the very least; a brave or possibly drunk relative who owes you a favor. Batteries last for 2-3 years and are easily replaced. The LED lights are nice and bright and are advertised to last for 10 years! This is the perfect light solution to put around windows, patio, garden, pathways, etc… For $25 or less, you will get your money’s worth from these right away. Comes with 16 foot cord so you can position the solar panel just about anywhere. Find one that literally looks like a car headlight beam is shining down upon you. Great way to light up an entry way or patio. Need to Light a Larger Area? Some are more reminiscent of the very bright, common electrical security lights, this one will light up a whole section of the house as soon as motion is detected. They come with dual lights which are perfect for mounting along dark corners or even along wide, straight areas of the property. Also, has long cable and replaceable battery packs as options. Do you have a garage without light or dark basement or closet? Solar lights will not work for areas that do not receive the energy from the sun. However, other, battery powered units are perfect for those situations. What is the best home security system? The Barking dog alarm wasn’t bad, but is it enough? Great news, if you’re in the market for a cheap, do it yourself home security system. A few weeks ago, a neighbor of ours was burglarized. Nothing was taken from their house because they had a professionally installed Home Alarm System. According to the police, the loud, piercing sound of the alarm is the best home security system you can possibly have and totally discouraged the burglars from even trying. I felt it was long past due that I protected my own house before I became a victim. The best home security system is the one that makes burglars think twice, right? So, what is the best home security system company for me? The Skylink Deluxe SC100 is Wireless Home Alarm System by Skylink that costs only $109.95 and is a breeze to install. This kit includes: Wireless Keypad with alarm, two door/window entry detectors, one motion detector and remote keychain. What sold me on this particular kit was its starting price and expandability. Up to 30 motion or accessory products are supported. Also, a dial-in unit can be added for approximately $100 that accomplishes exactly what I had hoped was possible: The Emergency Dialer will store and dial up to 9 different phone numbers in-case of a break-in. There are no monthly fees. The way I look at it, this is a much more effective way of responding to possible break-ins, because it puts me in full control of how to proceed at my own discretion. The complete package with the emergency dial-in unit (See Image Below), Skylink SL Gold Deluxe, can be had for a little under $200.00. I opted to forego the dial-in unit initially, knowing that I could order it later, if I was satisfied with my initial setup. (Dial In Unit Show Right) AD433-S.
Only one shortcoming would prevent me from rating this product even higher: It would be nice if the transmitter kept a log of door entries, alarm breaches, etc. Otherwise the Skylink SC100 is an excellent choice and I believe it to be the best do it yourself home security system for a reasonable price.